1860s--Sandlot baseball originated in what is now the greater Civic Center area in the 1860s. First California team organized in Dan's Oyster saloon on Montgomery St.. They elected officers, held regular meetings, went on drinking together, "but never did get around to playing a game." 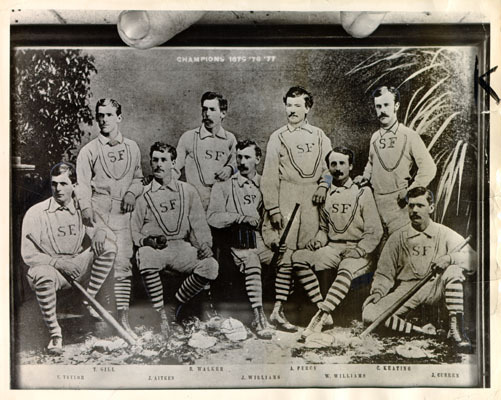 Feb. 22, 1860--California's first official ballgame played in San Francisco. 1869--Cincinnati Red Stockings arrive on first transcontinental commercial rail run, win all games played in San Francisco. They were the baseball team of the day. 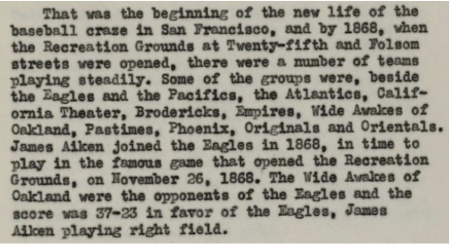 In September 1869, at Folsom and 25th, they proceeded to blow out our Eagles 35-4 on the 25th. The Eagles dusted off and… lost again. Even more badly, 58-4. 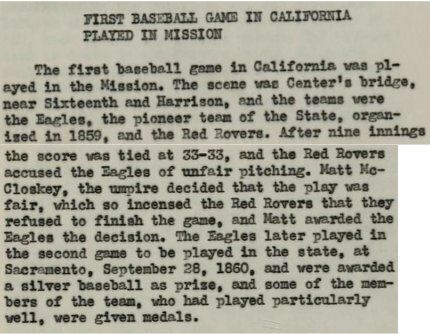 Check out Burrito Justice for a lengthy and map-rich account of early baseball in the Mission District, including remarkable efforts to identify where the original diamond of Recreation Grounds would be today.